This photograph shows an interior view of the Harris and Baugh Drug Store in South Haven, Kansas. 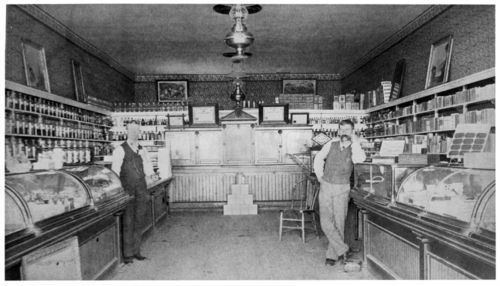 The two men visible in the picture are identified as Will Harris and L. F. Baugh, the owners of one of the first drug stores in South Haven. There are several display cases visible on both sides of the picture, and the walls are lined with shelves filled with bottles of chemicals and pharmacy supplies, plus some books on the shelves on the right side of the picture. Two signs near the man on the right advertise "Glue," and "Red Cross Cough Drops." Holding Institution: Mrs. D. G. Heeney, 1965.